When trying to rank the greatest fighters of all time there are many different criteria used. Included in these are boxing ability, punching power, defensive skills, longevity, consistency, the ability to take a punch, and the opposition encountered. 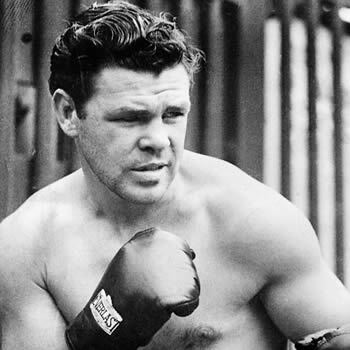 Former Welterweight and Middleweight Champion Mickey Walker would not rank high in the categories of boxing boxing ability and defensives skills, but he more than made up for that in the ability to take a punch, longevity, and the quality of the opponents he took on. Not only did he win the welterweight and middleweight titles, he also fought for the light heavyweight championship losing a decision to Tommy Loughran. But that was not enough for the 5’7” slugger. He also became a contender for the heavyweight championship. Walker, from Elizabeth, New Jersey, began his professional career in 1919, and in 1921 he held welterweight champion Jack Britton to a draw over 12 rounds. In 1922 he would get another shot at Britton and this time he pulled out a decisive win knocking the champion down 4 times on his way to winning the title. 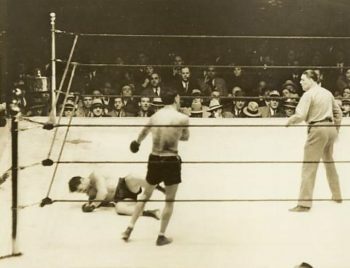 In 1925, Walker moved up in weight class and took on middleweight champ Harry Greb in a bout that would become the stuff of legend. Well, not the bout in the ring but the one that supposedly took place in the hours after that encounter. In a 1981 interview with Peter Heller for his book “In This Corner”, Walker told his side of the story. He concedes Greb won the fight in the ring that night but says he won the rematch that took place outside of a barroom hours later. About Greb, Walker had this to say “He gave me a good shellacking the night we fought. The fight after, on the street, I always take credit for winning that, so I was champion anyhow.” He goes on to relate how the two had been drinking together in the company of their girlfriends. The trouble began when they walked outside and Mickey told Greb “You know Harry, you’d never have licked me if you didn’t stick your thumb in my eye.” Walker said he didn’t mean it as an insult, but Greb certainly took it as one. Harry responded “Why you bum, I could lick you if I had no hands, and I’ll show you.” As Greb said this he began taking off his jacket. Just as Harry had his coat part way off and with the sleeves down by his elbows Walker fired off his best shot at him. According to Mickey, Greb flew four feet into the air and up against a wall before crashing to the ground. At this point a huge policeman stepped in and broke things up. After his evening with Greb, Mickey returned to defending the welterweight title but in 1926 he lost it to Pete Latzo. At this point he was having difficulty making the weight. He returned to the middleweight division and later that same year he won the title from Tiger Flowers. It was at this point that Walker got an itch to go after bigger game. Though he had not gotten any bigger he decided to campaign in the light heavyweight division and took on former champ Mike McTigue whom he kayoed in one round. He then won a decision over Paul Berlanbach. Mickey continued defending his middleweight crown while fighting the bigger men and eventually earned a shot at the light heavyweight championship taking on champion Tommy Loughran. On March 28, 1929 he lost a ten round split decision to the smooth boxing Loughran. After the loss to Loughran, Walker ran off 22 straight victories in the middleweight and light heavyweight divisions. He also did something else; he began fighting heavyweights. He believed he would have better luck against the very big guys because they would be slower and easier to hit. For a time it looked like his reasoning was paying off. He beat the very tough Johnny Risko twice and then took on the fearsome Bearcat Wright. Outweighed by 42 pounds and a half a foot shorter than his opponent, Walker, after being down briefly in the first round, came back to floor Wright and by the tenth and final round had Bearcat hanging on. 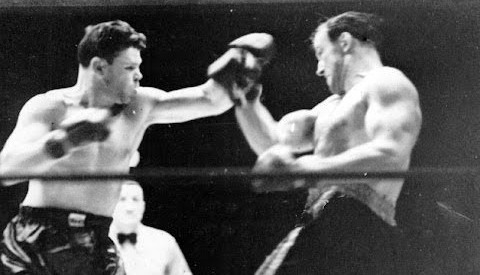 Mickey won the decision and the opportunity to take on Jack Sharkey in an elimination bout to determine a challenger to champion Max Schmeling. 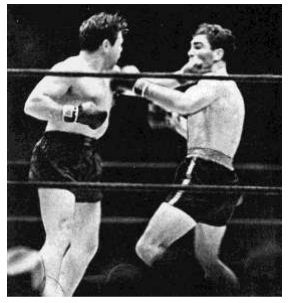 Walker fought aggressively against Sharkey and, while absorbing quite a few heavy blows fromJack, kept the pressure on to earn a draw with the future heavyweight champion. It was an amazing performance by the 5’7″ Toy Bulldog. Mickey continued taking on heavyweights and defeated King Levinsky and Paulino Uzcudun while dropping a decision to Johnny Risko in their third meeting. In 1932 he would be matched with the now former champion Max Schmeling. A win over Schmeling would put Walker in line for a shot at champion Jack Sharkey. Schmeling was the one big man Walker should not have stepped in with. Mickey’s straight at you style was made to order for the counterpunching German who knocked Walker down late in the first round. Mickey took an awful beating as Max continually landed with his vaunted right hand. Mickey kept attempting to land hooks on Max but was out punched time and again In the 8th round Walker, with his eyes swelling shut was dropped two more times. At one point Schmeling pleaded with the referee to stop the fight. When Walker returned to his corner his seconds waved the towel signifying their man had had enough. In the Schmeling fight Mickey showed incredible courage, but this fight also took a lot out of him. He would continue fighting but was never the same again. He would challenge one more time for the light heavyweight title, losing a decision to Maxie Rosenbloom. He never lost his middleweight title, rather he gave it up when he set his sights on the heavyweight throne. Mickey Walker retired from the ring in 1935. His final record is believed to be 131 wins (60 by knock out), 25 losses, 2 draws, and 2 no contests. After retiring he opened a restaurant in New York City and also took up painting. He earned some renown as an artist and his work was displayed in galleries in New York and London. Walker died in 1981 after suffering from Parkinson’s Syndrome no doubt brought on from his years in the ring. If greatness was judged solely on toughness and heart Mickey Walker would rank very near the top.